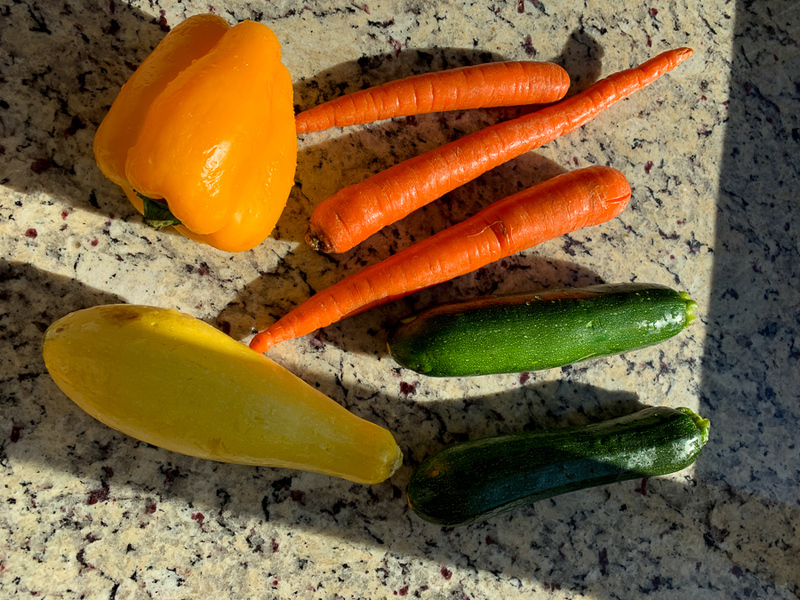 As a post-baby followup to my meal planning posts, I wanted to write a little about what I’ve been doing to keep the fresh food flowing. Here are some of the ways we’re getting our food on the table. 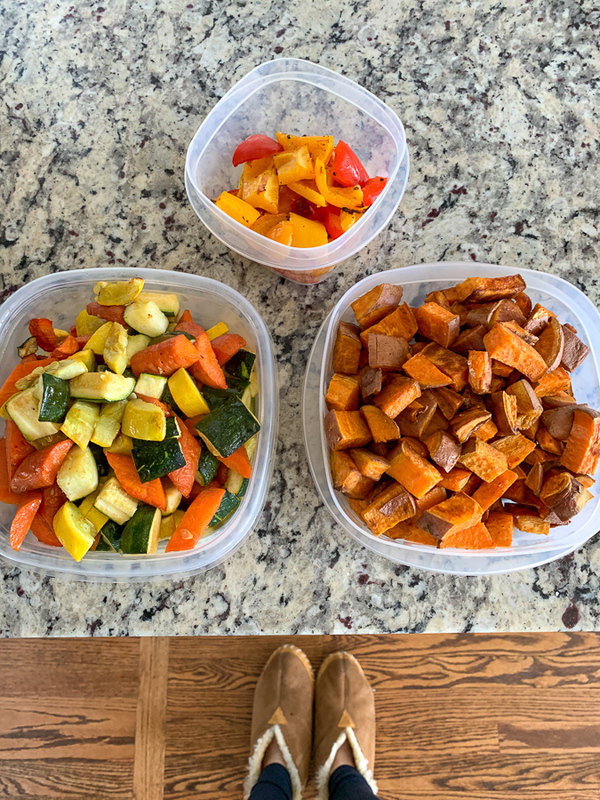 I’ve gotten back into the prep day a bit after realizing how lovely it is to have cooked veggies in the fridge during the winter when I’m craving less salad. 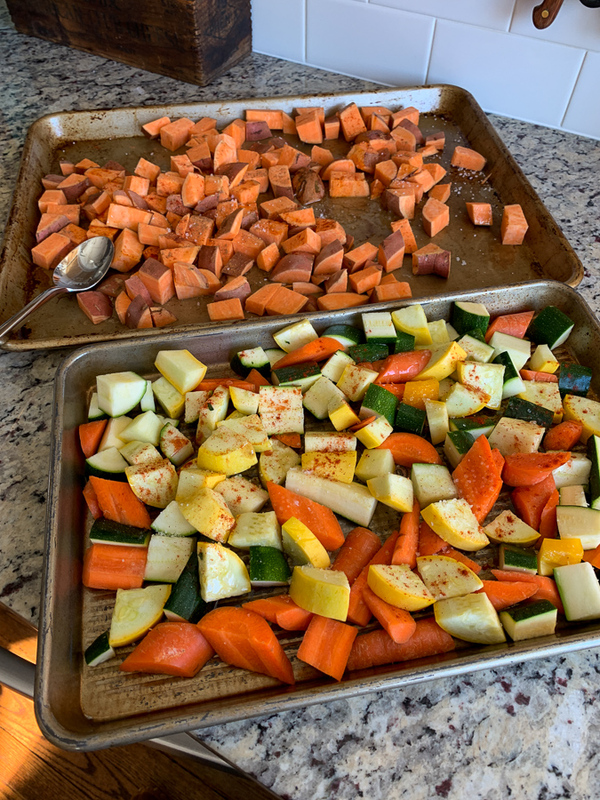 I’ve been making a massaged kale salad with lacinato kale (my new fav) and roasting up a few sheet pans of veggies and sweet potatoes to pair with Plenty dishes (see below) or have on the side of a sandwich or salad for lunch. Favorite: roasted bell peppers! 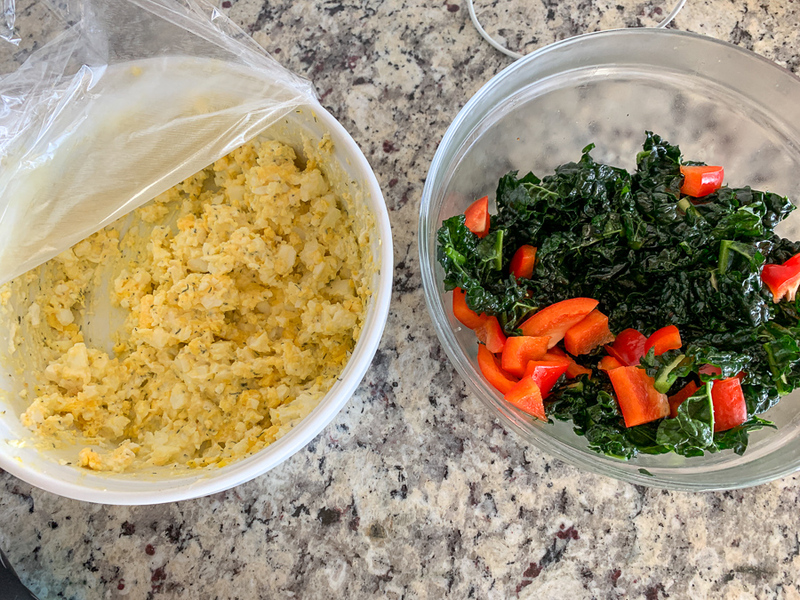 I’m also trying to get some use out of the Instant Pot and making either egg salad, hard-boiled eggs, baked sweet potatoes or mac and cheese once a week. This doesn’t always happen on a prep day, but when I do make it, it lasts a while. I also always make 2-serving smoothies these days and have one for breakfast and the other for snack or breakfast the next day. Might as well blend once, eat twice! Same goes for oatmeal – I always make extra portions now to reheat the next day. The “egg loaf” made in the Instapot makes the fluffiest egg salad! I’ve written about Plenty several times on the blog, but we have LOVED the personal chef service! It’s surprisingly affordable – a one-time $50 cost to cover glass Pyrex containers and then an a la carte menu each week. I love that you don’t have to commit to a certain amount of food. We’ve been spending $50-100 a week on 1-2 entrees and some staples like quiche or soup. Naturally our grocery bill has gone down, so it balances out. The meals are SO GOOD and very healthy, real food-based too. 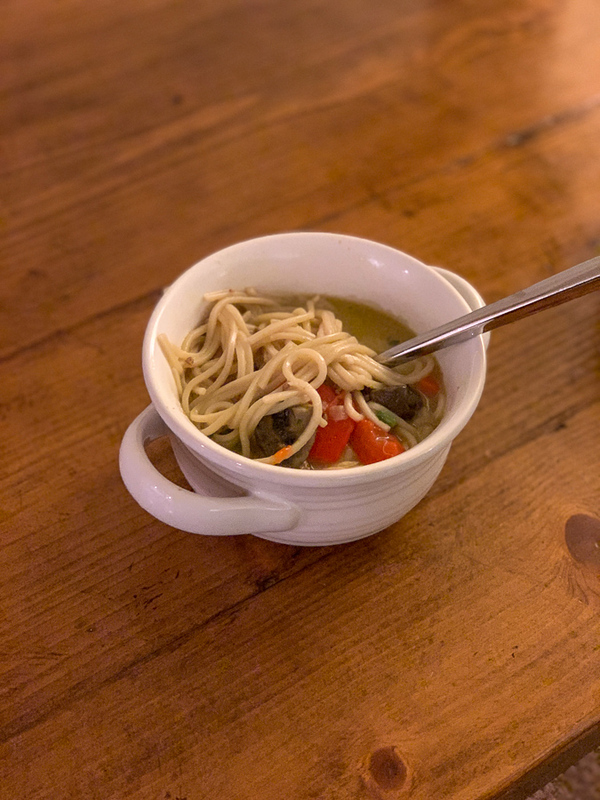 It’s been so, so nice to have things like made-from-scratch meatballs with pesto or ramen soup to have on hand. The quiches are my favorite because I can eat them anytime! To fuel those special weekend meals, we’ve been relying on Butcherbox for our grass-fed products, wild salmon, and the like. 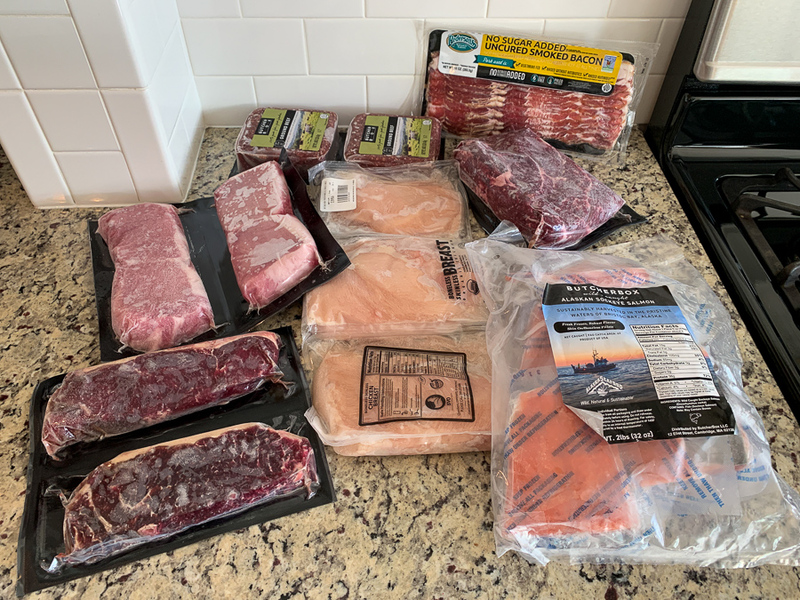 I love that our box has staples like chicken breast, special steaks that we might not otherwise buy, and larger cuts of meats that Thomas loves to smoke. Plus wild salmon! And since we’re using Butcherbox and Plenty for the bulk of meals, our grocery store visits are usually very quick. The list usually says: Milk, coffee, yogurt, eggs, fruit and a ton of veggies. 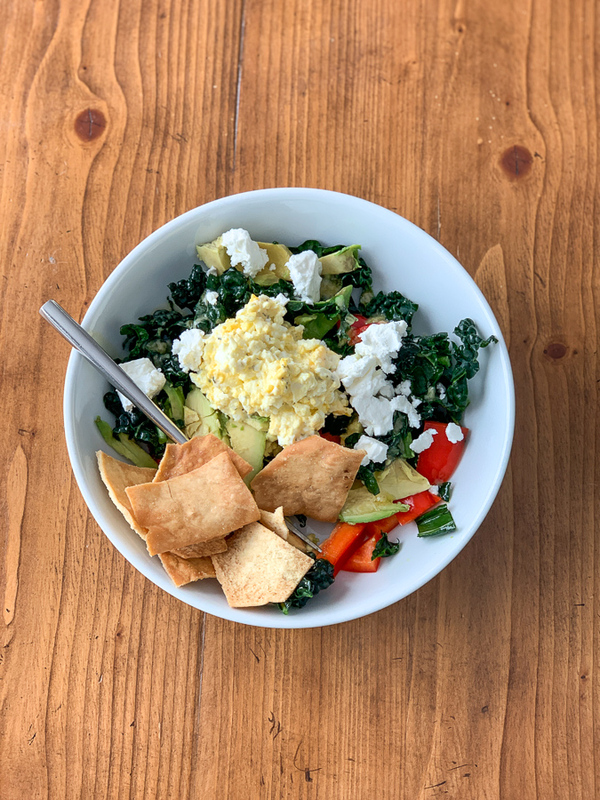 Instant Pot egg salad on prepped kale salad! Obviously we are not meal planning all-stars over here, but we are doing our best navigating life with our two kiddos and busy weeks. Love it! I’ve been trying to do only once a week groceries on Saturday and it does feel great to get it out of the way early! We like to use our sous vide during the week. Last night we had steaks which I started in the water bath and then they were hands off so I could take care of the kids until my husband got home to sear them. It is one of our favorite kitchen gadgets and is so helpful during the week with two kids and two working parents! I never would have thought of sous vide! 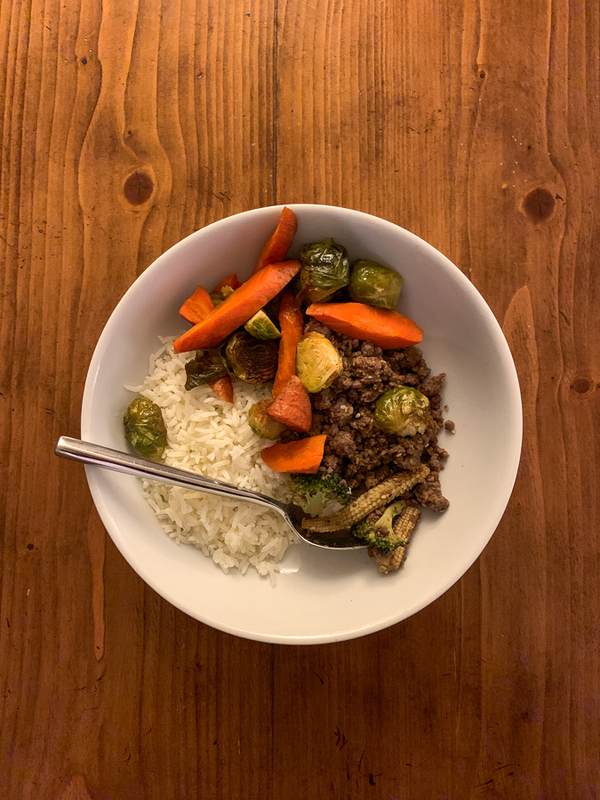 One of my favorite uses for the Instant Pot is to steam veggies in it – kale, broccoli, cauliflower. It’s quick and makes them taste great! Roasted veggies were a game changer for me! Once I realized I really liked them reheated as well, I started making them every week. Throw an egg over easy on top for breakfast, make bowls with quinoa or farrow, or mix into pasta. Nutritious meals are a snap. My oven died last week though, sob! And then my crock pot broke. So I’m getting a much-needed new oven and taking the plunge on an Instant Pot. They are so great in the winter when cold salads aren’t as appealing! Looks like you’ve got your meal situation under control!. Roasted is by far my favorite way to prepare vegetables. I have to say, I don’t see the appeal of ButcherBox. I assume the meat comes wrapped in a lot of packaging in order to keep it frozen. Unless they let you send the containers back to be reused, this seems really wasteful and bad for the environment. And it’s not like Cville doesn’t have abundant organic or grass fed meat and wild caught fish to buy locally. And while I do stock some meat in my freezer, I prefer to buy it fresh, unfrozen a day or so before preparing the meal so I don’t have to deal with the defrosting process. The only thing I almost always buy frozen is fish. Agreed. I hope this is okay to say (I don’t want to offend), but I don’t understand the appeal. I looked into it, but since I have access to organic/grass fed meat at the store that is less expensive, I didn’t see a reason to order it. I think it would be great if I lived somewhere with less variety at the store. 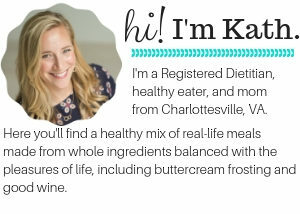 Can you share your prepped kale salad recipe? It’s lacinato kale, washed and chopped, and then massaged with a little lime juice and olive oil, plus sea salt and pepper. Sometimes I’ve been adding chopped red peppers and feta cheese too. 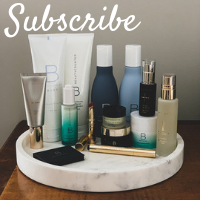 It looks like you are doing fabulously nourishing you and your family! I love that there’s no one way to meal plan. I have a friend who cooks large amounts of meat or taco meat on Sundays and uses it through Wednesday in various ways. Whatever works so that there is a plan and eating intentional and not stressful! I’m home on maternity leave with my son right now and I’ve found it’s such a big help to do a weekly food prep over the weekend, too. Mostly for lunches for me since I’ll be out and about and get home starving and wanting something quick that’s still healthy. I’ll usually prep up a grain, like quinoa, roast a ton of veggies and make either chicken or tofu so I can put together big salads or grain bowls for lunch. Love hearing what you’re doing, too! I have never heard of butcherbox and will definitely be looking into it! I’m very skeptical about meat in the grocery stores today and would love something I could rely on like this! How many servings are in the entrees you order? I wish we had something like that!